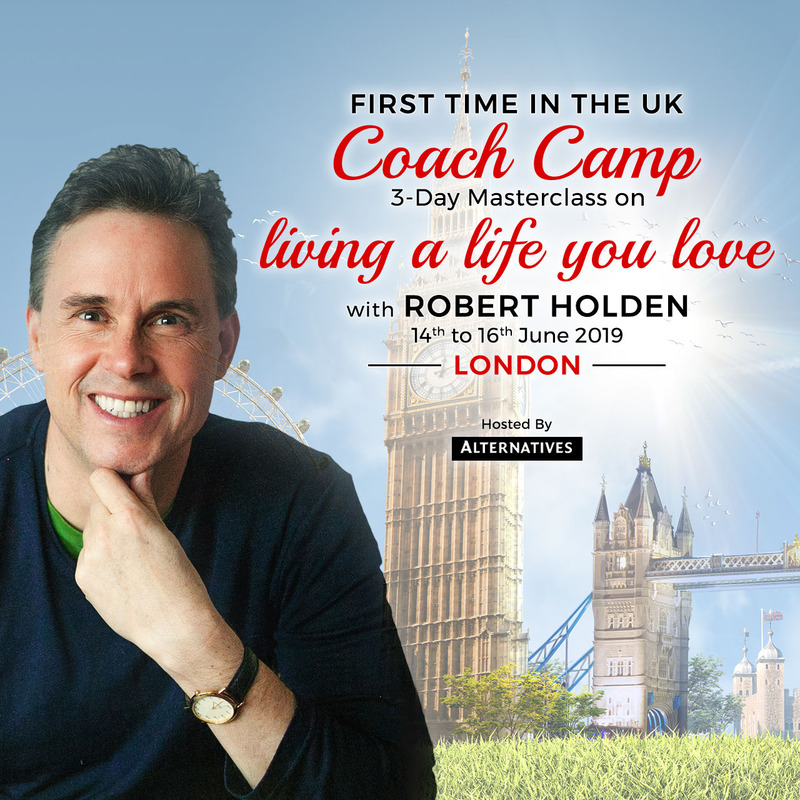 Coach Camp - London | Robert Holden, Ph.D.
Join Robert Holden on COACH CAMP – a 3-day Coaching Masterclass on which Robert shares life-changing lessons from 25 years’ experience as a teacher, mentor and coach. Robert brings COACH CAMP to the UK for the first time this summer – partnering with Alternatives! Over 2000 coaches, authors, movers and shakers have attended COACH CAMP in North America – to rave reviews. At COACH CAMP Robert shares the philosophy and methods of his scientifically tested work with The Happiness Project (founded 1994) and his leadership programs with Success Intelligence (Est. 2000). He also reveals how working with A Course in Miracles, the Enneagram, The Hero’s Journey, and with teachers like Louise Hay, has helped take his work to a higher level. SOUL-CENTERED COACHING The purpose of being a coach is to help YOU and OTHERS live a soul-centered life. Robert presents his theory of coaching that he teaches on the Santa Monica University’s Soul-Centered Coaching program. SUCCESS INTELLIGENCE The next level of success is really a dare to be the real you! Robert shares inspiration from his highly acclaimed Success Intelligence Mastermind Group, a 6-month coaching journey for taking your success to the next level. SHIFT HAPPENS! Who you think you are can’t handle your greatest challenges; but who you really are can and will! Robert’s talk-show Shift Happens! is in its 10th year with Hay House Radio. Here, he shows how to encounter fear, self-doubt, inner-criticism, stuck-ness and other obstacles on your path. SELF-LOVE & THE ENNEAGRAM “The Enneagram is the most powerful tool I know for undoing blocks to happiness, success, love and abundance,” says Robert. Robert demonstrates how he uses the Enneagram for self-coaching and coaching others. This session includes 9 practical exercises on loving and being loved. EVERYDAY MIRACLES A miracle is a shift you experience each time you choose love instead of fear. Robert shares how being a student of A Course in Miracles has inspired his life and his work as a coach. In this module, he focuses on the miracle of forgiveness. YOUR HERO’S JOURNEY “The big question is whether you are going to be able to say a hearty yes to your adventure.” said Joseph Campbell, creator of The Hero’s Journey. Robert helps you to commit more fully to your SACRED YES – the YES that helps you live your life on purpose. SPIRITUAL ENTREPRENEURSHIP Leadership is not just a position; it’s a way of being! Robert shares inspiration on leadership from his work with clients like DOVE & The Real Beauty Campaign, Hay House, Virgin, Unilever and The Body Shop. Robert has presented talks and workshops for ALTERNATIVES every year since 1994. He has given two popular TED talks – The Tea Meditation and Destination Addiction. He is a New York Times best-selling author. His books include Happiness NOW!, Shift Happens!,Authentic Success, Loveability, and Life Loves You, co-written with Louise Hay. Robert is an official contributor to Oprah.com and the Chicken Soup for the Soul series. He hosts a weekly radio show on Hay House Radio called Shift Happens! He is currently writing a book of poetry called Finding Love Everywhere.